Hey Caps fans! Can you believe it’s finally that time of the year? The moment we’ve been waiting for all dreaded summer long; CAPITALS HOCKEY. Break out those sweaters and get ready to rock the red, because the season is coming to you live from the Verizon Center on October 10! The good news is that we have many things to look forward to this year, so it’s finally time to let go of that game 7 against the Rangers that broke all of our optimistic little hearts last postseason (sigh). What happened in the offseason? GM Brian MacLellan did wonders for the club over the offseason by hooking them up with more options for top-six forwards in RW Justin Williams and RW T.J. Oshie. Williams, coming off his contract with the Los Angeles Kings, had everything the organization was looking for; an experienced (and affordable) right winger who is able to play at both ends of the ice with ease. Not to mention, Williams is a three-time Stanley Cup winner and the 2014 Conn Smythe winner, so that’s certainly something that should boost the Caps’ confidence going into the season. 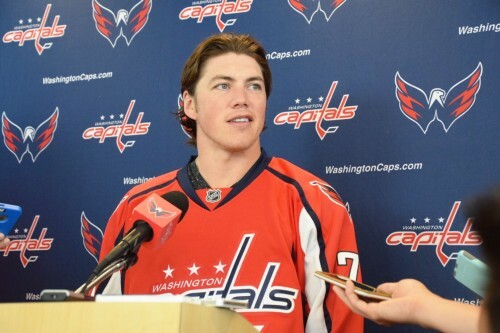 As for Oshie, he is obviously the most anticipated player the team has gained this summer – and for good reason. Oshie is no stranger to the colors red, white and blue, as he was the Team USA hockey hero back in the 2014 Sochi Olympics, where he netted five shootout goals, round after round, which lead America to a 3-2 victory over Russia. Oshie is the epitome of a well-rounded forward who can dish out a hard hit, light the lamp, set up a play at the end of the ice, and he can stickhandle like you wouldn’t believe. With all of these qualities that the Warroad, Minnesota native possesses, it is almost guaranteed that we will see him playing alongside Caps stars Alex Ovechkin and Nicklas Backstrom on the top line throughout the season. But, I believe that it may take Oshie a bit of time to get used to the speed of the line and adjust to the system Trotz has set in place. He is likely to have a similar role that he had on the St. Louis Blues first line, which took advantage of his superb on-ice vision by creating space and putting the puck on net for his teammates. With a team that has been at a constant struggle to find six solid forwards to round out their top-six, it is comforting to know that the goal has been achieved with the addition of these players. Now for the sad stuff. We lost a couple key players when we acquired the new. The beloved Joel Ward and Troy Brouwer are gone but never forgotten. This means the Caps are down two out of five of their top penalty killers. Their efforts took them from being the worst penalty-killing team in hockey history, to being…just okay. The Caps have never been a great team on the PK, but with the departures of Ward and Brouwer, the special team may be in for a bit of trouble. This will force guys like Brooks Laich, Jason Chimera, Jay Beagle and Tom Wilson to pick up even more PK time, which could either be a very good thing.. or a very bad thing. I guess we’ll find out sooner rather than later. 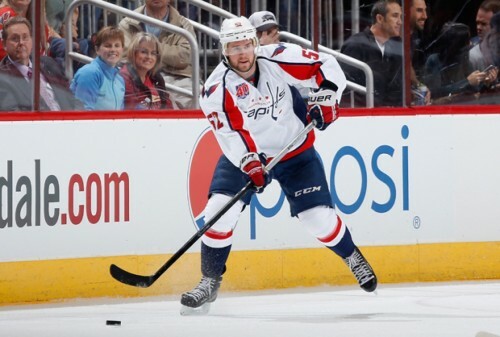 The Caps also lost veteran D-man, Mike Green, as his contract with the organization was up. Green will remain in a red jersey as he continues his NHL career in Motown with the Detroit Red Wings. It sure will be weird not seeing him in the lineup, since he’s played in 575 games over the span of ten seasons with the Caps, but it was time to say goodbye. Green was a third-pair defenseman, but had the third highest cap hit on the team.. Something doesn’t quite match up. His last three-year contract paid him $18.25 million, with a cap hit of over $6 million. That was the highest cap hit of all pending free agents. Green’s play just goes to show that he is not a player worthy of taking up such a large chunk of change in the Capitals’ salary cap. Sure, he was the Caps’ greatest offensive defenseman, but he always seemed to crumble under pressure, taking stupid penalties during the most crucial part of the game. He proved himself to be more of a liability than anything else leading up to his final year in Washington, and his departure is for the best for both parties. I wish the best of luck to Greeny in his future with Detroit, though. Hopefully he will be a better fit in their puzzle, and get a bit more ice time. It has been released that Nicklas Backstrom will miss the beginning of the season due to recovery of a hip procedure undergone in the offseason. Fingers crossed for a speedy recovery so he can return to the lineup and begin the quest for the Cup as soon as possible. 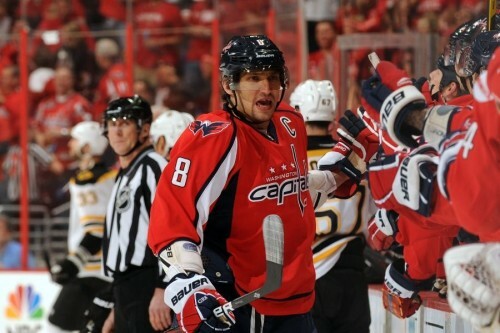 Ovechkin is back and just as good as ever at the ripe age of 30. Last season he won yet another Rocket Richard Trophy with 53 goals, making it his third consecutive and fifth overall. It’s been a long time coming, but The Great Eight has finally morphed into a two-way player through Trotz’s system. His newfound willingness to play both ends of the ice makes a world of difference. As previously stated, Oshie and Williams are warmly welcomed into Washington as two new top-six forwards, which should provide the Caps’ offense with more balance up front. With Eric Fehr’s departure to the Pittsburgh Penguins, this leaves the third-line with a missing left winger. This position will be filled out by either Andre Burakovsky or Marcus Johansson. With Evgeny Kuznetzov proving himself capable of taking on the role of second-line center, and Tom Wilson’s physicality on the third line, (and hopefully more production) the young guns will be fun to watch develop into the NHL players they were destined to be. Washington should see a drastic improvement in their offensive unit this season, minus the losses of Ward and Brouwer. As for the Caps’ blue line, things are looking somewhat questionable. With the exits of Mike Green and Tim Gleason, Dmitry Orlov and Nate Schmidt are expected to step in and fill their shoes. Since Schmidt has never actually played a full season at the NHL level, and Orlov is coming off a wrist injury that cost him the entirety of last season, the expectations from this duo remain uncertain. Veteran defenseman John Carlson will have to produce more on the first power play unit with the void that Green is leaving behind, and hopes are high that the aging Brooks Orpik can pull through another season at top-pair minutes. 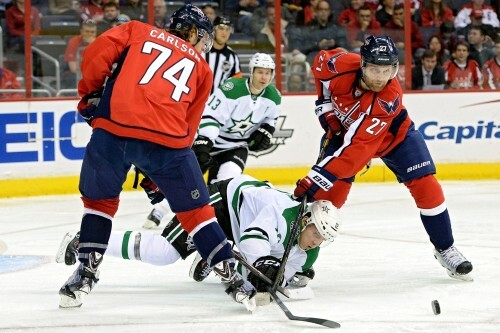 The defensive pairings are projected to be: John Carlson – Karl Alzner, Matt Niskanen – Brooks Orpik, and Dmitry Orlov – Nate Schmidt. We may also see Trotz giving top prospects Madison Bowey and Connor Carrick some ice time throughout the season. Three words: HOLTBEAST IS BACK. 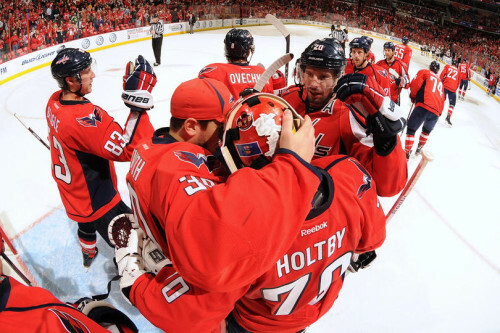 The Capitals have re-signed Braden Holtby to a five-year, $30.5 million contract. He will be paid $3.5 million plus a $3 million signing bonus for the 2015-16 season, $7 million for the two seasons after that, and $5 million for the final two. Holtby is the third goalie in Capitals history to win 100 games, (alongside Kolzig and Beaupre) not to mention he was the fastest in doing so in just 176 games. Many believe that Holtby is in his prime after the commendable season he had last year, and the best part is, he has the potential to be even better. Hershey Bears goaltender Philipp Grubauer is expected to make the move up to Washington to provide the Capitals with a better option of relief, which means Holtby might actually get some rest this season! Grubauer does not have a whole heck of a lot of experience at the NHL level yet, but his numbers from last season in Hershey indicate that he will more than likely get the position over Justin Peters. I know this statement is thrown around every year for the Caps, but I really do think this is their year to shine through and show everyone what they’ve been developing these past couple of seasons. Trotz has been given the players with the key elements needed to become one of the biggest threats of the Eastern Conference. I see the Caps bouncing back from their loss to the Rangers last season, and going on to win the Eastern Conference, with a challenge from the Tampa Bay Lightning, of course. They will compete in their first Stanley Cup Final since 1998. I believe in this team now more than ever. Don’t miss the Caps take on the New Jersey Devils in their season opener on Saturday, October 10 at 7 PM on CSN. You can also listen to all the games live on the Caps Radio Network (flagship stations FAN 106.7 and 1500 AM), CapsRadio247.com, WashingtonCaps.com and on Washington Caps mobile app.